the last time we were in the states, a bright yellow book with an adorable little monkey on it caught my eye (and the eye of my then 5-month-old little man). it was at the cash register of an old navy store (crazy, i know. i bought a bag there. it's colour? yellow too, haha!) it was the only book around, i'm not sure why they had it there, but since then it has turned to a most-loved first favourite book! 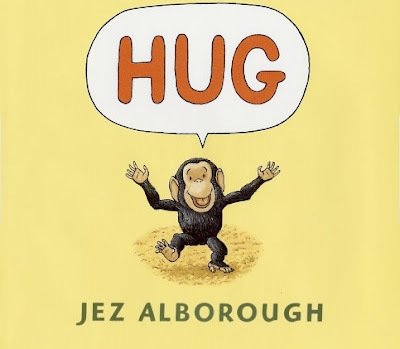 HUG, by Jez Alborough. it is a very cute picture book with a story of a little monkey being helped by his animal friends to find his mommy and get a hug. the monkey's name is Bobo, and even though our little one is slow with learning (or perhaps, just with saying) new names, he has asked for "Bobo" to be read with him a few times now at bedtime. so, this is my first childrens' book related post, but i do hope it's not the last. you can never have too many books around. My inner librarian loves this post! And I love your wall of books! Good for you for reading to your little one - the greatest gift you can give to your child is reading to them! 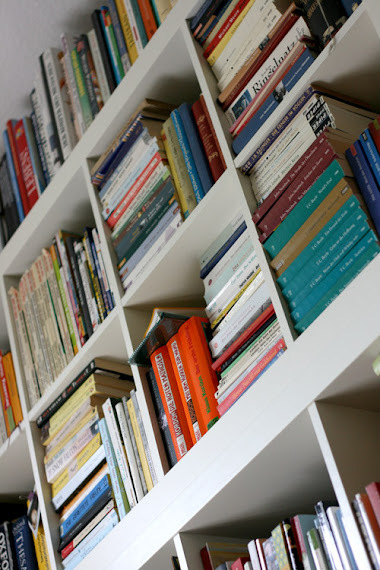 Love your book shelves. You never can have too many books, it's so true. We have a book by Jez Alborough called Fix-It Duck and it's one of the funniest, most well-written children's books we have. My kids love it and I have such a blast reading it to them. I hadn't thought to look up more books by that author, but I think I will see if my library has any. The book is very cute, indeed. I've got a similar book in German about a baby-polar-bear searching for his mama and learning about love by all the other animals living in the arctic. Used it in playschool for children who obviously were lacking loving hugs at home.